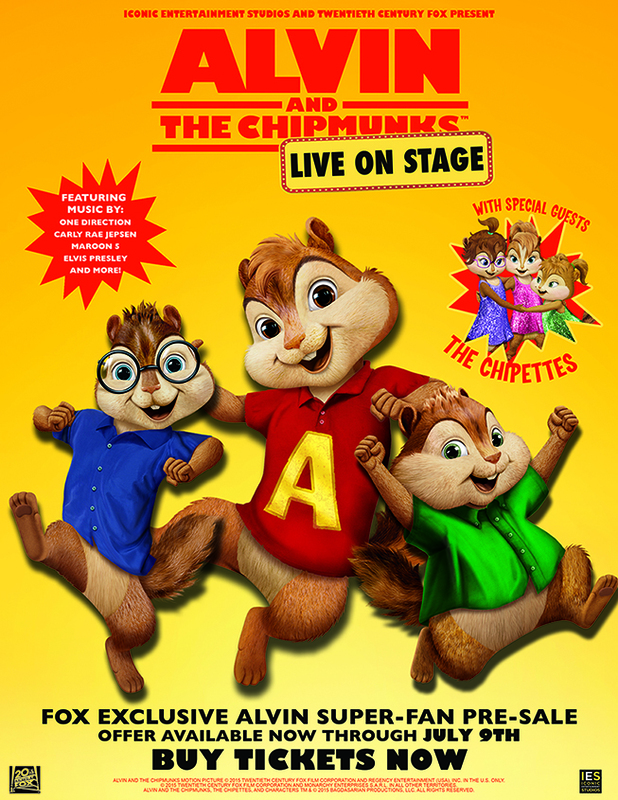 Twentieth Century Fox Consumer Products and Iconic Entertainment Studios will bring “ALVIN AND THE CHIPMUNKS: LIVE ON STAGE!,” a brand new, music-filled interactive live show, to the Rosemont Theatre, 5400 N. River Road for four performances November 20 and 21. 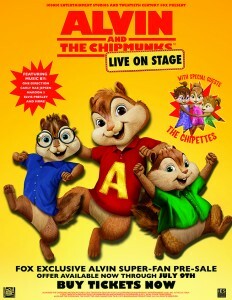 The world’s most famous chipmunk trio – accompanied by the Chipettes – will delight fans of all ages with a live performance that will feature spectacular production values, music, special effects and immersive interactivity to encourage audience participation.Based on the characters from the hit Twentieth Century Fox movies, the show will brings to life the music and excitement of a live rock concert with a little “old school” breakdancing and a “no-holds-barred” food fight as the Chipmunks perform hits by One Direction, Maroon 5, Carly Rae Jespen, Elvis Presley and more. Joining Alvin, Simon and Theodore are their special guests, the Chipettes. Performances at the Rosemont Theatre, 5400 N. River Road, Friday, are November 20 at 2 p.m. andSaturday, November 21, 10 a.m., 2 p.m. and 6 p.m. Tickets are now on sale and range from $25 to $75, and are available at ticketmaster.com, or by calling l 866.448.7849. For group sales, visit www.grouptix.netor by calling 773.327.3778 for group ticket discounts. Iconic Entertainment Studios is Michael Cohl’s diversified international family show and event entertainment company specializing in the acquisition, development and production of high caliber touring exhibitions, unique live music tours and events, theatrical performances, and consumer and multimedia product offerings. Clients have included The Rolling Stones, U2, Pink Floyd and many others throughout the world. Current and recent productions include: “Barbra Streisand,” “David Gilmour,” “Spider-Man: Turn Off the Dark,” “The Marvel Experience,” “Rock of Ages,” “An Evening with Al Pacino,” “A Night with Janis Joplin,” “Super Why!,” “Rudolph The Red Nosed Reindeer” and “Alvin and The Chipmunks.” For additional information, visit: www.s2bnentertainment.com.